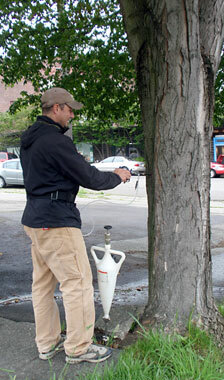 Treatments - Tree Solutions Inc.
We have several WSDA Licensed Commercial Applicators on staff. They are available to assess your situation and if necessary, recommend and provide the proper treatments. We utilize broadcast, systemic, and micro-injection systems. We can treat trees for aphids, mites, scale, bronze birch borer, cherry bark tortrix, Dutch elm disease, phytophthora, armillaria and others. We can apply micro and macro nutrient enhancements to encourage plant growth. We can also help control tree height by applying plant growth regulators which can reduce leaf size, shoot elogation, wood production and in some cases, eliminate flowers and seed/nut production. An Air Spade, or Air Knife, is a non-invasive tool that uses pressurized air to excavate around root systems. We work with external companies that use this device to locate roots, uncover hidden issues and incorporate amendments into the existing soil.